Created in 1991, OCISO’s Multicultural Liaison Officer Program (MLO) addresses the settlement needs of immigrant and refugee families in Ottawa schools. The goal of the MLO Program is to help ensure the successful integration of newcomer children and their families in Ottawa schools. The program takes a three-pronged approach that involves the student, the family and the wider school community. OCISO runs this program in partnership with the Ottawa-Carleton District School Board and the Ottawa Catholic School Board. 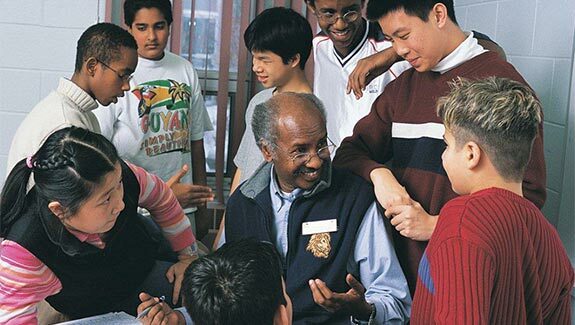 administrators and a broad range of organizations, enabling all involved to work toward shared goals, such as quality of education for newcomer students, increased intercultural competence and awareness, and a smoother integration of immigrant and refugee families. What makes the MLO program unique? Unique partnership between Ottawa School Boards, OCISO, the Federal Government and newcomer communities. Providing settlement services on site (in the past settlement services were delivered in settlement agencies) which makes the program highly effective. Through orientation, daily interventions, outreach and information sharing the MLO program contributes to student success, facilitates a relationship between the schools and new comer families, supports immigrant parents to become familiar and confident in dealing with the school system and supports the schools to create a welcoming environment for immigrant and refugee families. Based on the MLO program success in Ottawa, the Ministry of Immigration Refugees and Citizenship Canada (IRCC) adopted the MLO model and launched the Settlement Workers in Schools program, which now has 225 settlement workers operating in schools across Canada. The MLO program has become an important feature in many communities across the country and greatly contributes to creating welcoming communities for newcomers to Canada. If your school needs the services of a Multicultural Liaison Officer, please download the Request for MLO Assistance. Download our flyer to learn more about how you can support OCISO’s MLO program in schools. Donate and help a child succeed. Download this poster to help generate some ideas about how to increase the diversity in your school council. The Step Ahead Program (SAP) was developed in recognition of the fact that newcomer youth who arrive in Ottawa late spring or early summer face a unique set of challenges that can be met by a program that combines recreation, orientation and language instruction. The success of the SAP program is due to the fact that it provides opportunities for these newcomer youth to continue with their language learning and at the same time participate in fun recreational activities and field trips that orient them to their new city. For many of these youth the SAP program may be the only opportunity to be with other newcomer youth, and experience Ottawa with the support and guidance of committed and experienced OCISO staff and volunteers. The main purpose of the program is to assist new immigrant and refugee students to improve their English language skills, participate in recreational activities such as basketball, volleyball, and leadership games for four weeks during the summer and participate in orientation sessions about their new neighbourhoods and the city of Ottawa. The program reaches about 100 newcomer youth each summer. The ages of the students who participate are 13 years of age and up and the students are referred to the program from the schools and family reception centres that are attached to the schools. The program staff is comprised of OCISO staff and volunteers and the space is provided by the Ottawa-Carleton District School Board. 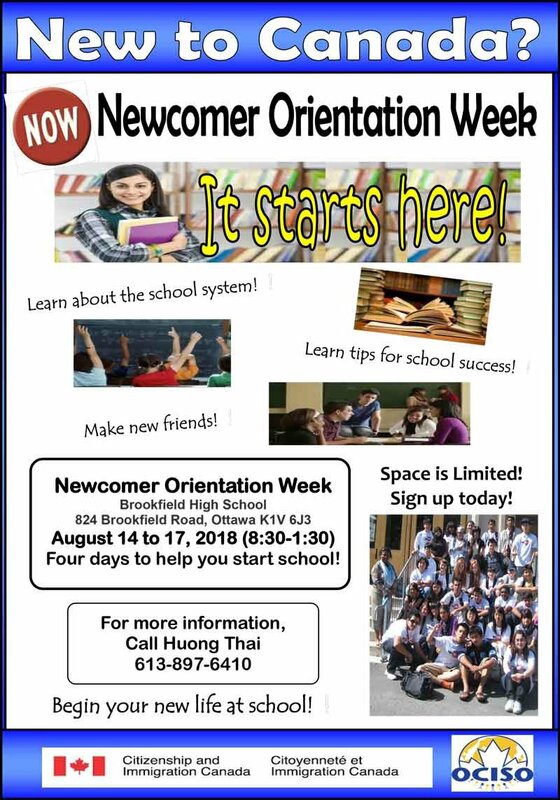 Newcomer Orientation Week is a program designed to welcome and orient high school students who have recently moved to Canada. The newcomer students learn about student life and the Ontario school system. Eligible students are those who have recently-arrived in Canada and will be attending a secondary school for the first time in Ottawa. The NOW Program is almost entirely led by secondary student Peer Leaders who receive intensive training .The NOW program is held each year during the month of August. Each summer 10 trained Peer Leaders and 30 newcomer students participate in the NOW program. Become A Member Today ! OCISO supports immigrants through the journey of making Canada their home by providing creative and responsive programs that are culturally and linguistically appropriate, by building community through mutual respect and partnerships, and by fostering healthy and inclusive spaces for open dialogue and healing. We are community based non-profit organization that has been providing services in Ottawa since 1978. We are motivated by the stories of new immigrants, and we are there every stage of the journey. OCISO directly serves over 10,000 immigrants and refugees every year. Our work is augmented by the generous efforts of our enthusiastic, caring and talented staff, volunteers, both established and new Canadians.